Cottonwood Co-op Oil Co. handles a full line of quality Cenex petroleum products to serve our customers. 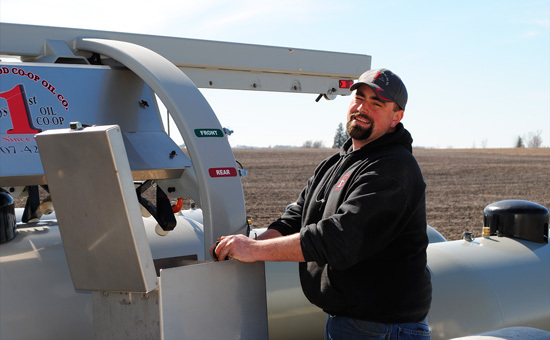 We deliver home heating oil, gasoline, diesel, and kerosene throughout our Lyon and Yellow Medicine County trade area. Serving our community with integrity and excellence, Cottonwood Co-op Oil Co. will work hard to earn your propane business. We offer propane for farm, residential, and commercial use, and we also offer propane programs so that you can protect the cost of your LP at any time you feel the market is right. Whether you want to budget or prepay for your propane, we have programs for that. Supply and safety is important to us at Cottonwood Co-op, so we will check your systems to ensure that they are working properly and sized efficiently. Cottonwood Co-op Oil Co. offers you a worry-free process for new propane lines may that be to your house or your barn. If you need a tank moved Cottonwood Co-op can do that as well.